This afternoon, I finally have the physical that will determine whether I'm healthy enough to have entered France. Yes, after 102 days in Paris, they are finally going to confirm whether or not I have the potential to start an epidemic of tuberculosis. In preparation for the exam, I looked over my paperwork last night. 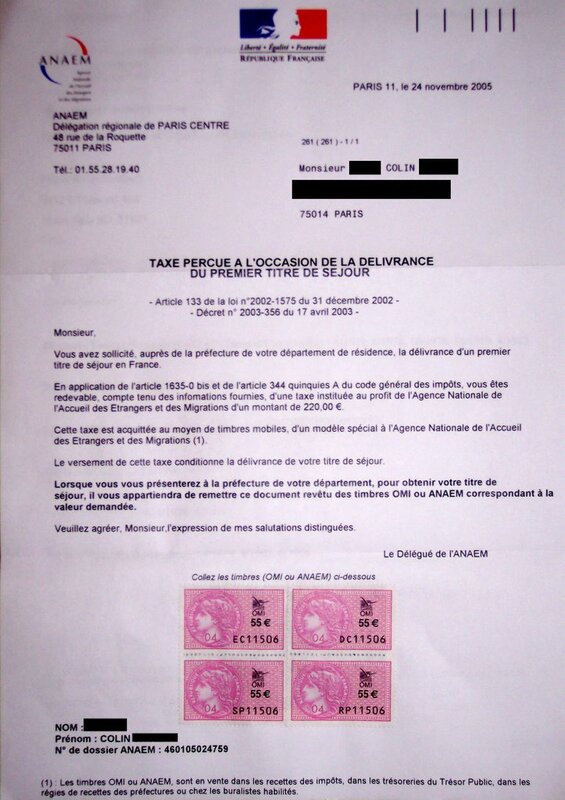 Among the recent additions is a letter that needs to have four stamps on it, proving I've paid the immigration tax. As I reread the letter, I realized: "Hmmm...they recommend getting these stamps at a Trésor Public. Hope I can do that tomorrow morning and that it won't take too long." A quick check in the Pages Jaunes ("The Yellow Pages") confirmed that there were two Trésors Publics in our arrondissement and that at least one of them would be open on a Monday morning. A Trésor Public is much like a county treasurer's office in the US. You go there to pay a variety of taxes and they handle all of the financial operations of the arrondissement. Since there's two of them in our arrondissement, you might assume that they're on opposite ends, to make things more convenient for everyone. We live in one of the larger arrondissements, after all, so that would make sense (the 14th has about 133,000 people living in a little more than 2 square miles). Mais non! 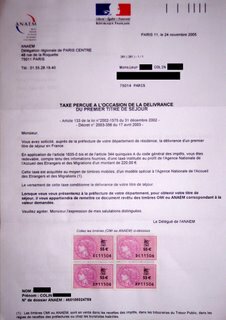 The logic of the French bureaucracy strikes again! Not only are they distant from the most densely populated portion of the arrondissement, they are only one block apart. Looking out the windows, I think you can see one from the other. Thankfully, they're only about 5 minutes away from our apartment on foot, so it was a nice walk on this dreary, damp, bone-chillingly cold morning. I arrived and, naturally, the building was under construction. But, they had a greeter at the door who was very friendly. I told him I was looking for the vente de timbres (the office that sells stamps) and he directed me to the first floor. I arrived there, found the correct office, and told the nice lady at the desk what I needed. She told me I was in the wrong office. So, after taking the elevator up to the fifth floor, I found the other vente de timbres. There was nobody at the counter. I had a nice view of the entire office, however, and noticed that all of the desks except two faced directly away from the counter. The two desks that didn't face away from the window faced each other, perpindicular to the counter. I waited patiently as the woman at one of these desks finished her phone conversation (the other desk was, of course, empty). When the woman transferred the call to her colleague, I caught enough of her conversation to know that it was clearly the funniest request she had received in a whle. "Can you believe it, this woman missed paying her business's taxes on December 3 and wants a prolongation exceptionnelle!" Her guffaws clearly implied that nobody was getting any extra time for paying taxes today, no matter how unusual the situation. Ah...the power of the fonctionnaire! Bear in mind that I come from a family with really strong math skills. By the time she asked me what the total was, I had already solved the problem in two different ways ("4x50=200 plus 4x5=20, so 220" and "55x2=110x2=220"). It used to drive me nuts when Dad would do this type of math game, but now I understand. I gave her the correct total, then she pulled out a calculator to check. Meanwhile, I continued to find new ways to solve the problem ("2x2=4x5=20x11=220," "2x5=10x2=20x11=220," "2x11=22x5=110x2=220," and so on). Finally, she had it and added 220 to the sheet of paper. Then she asked how I wanted to pay for it. I noticed the credit card reader on the counter, so I said "carte bleue" and pulled out my card. Looking at my card and then at the paper, she began reciting, "quatre OMI à 55 euros sur carte bleue." But, she never quite got the pen to touch the paper to write in carte bleue at the end of the line. Finally, she looked at me and admitted—"Can you pay by check, I'm not very good at working the card reader?" I've worked retail, and I know that the credit card machines in the US are more complicated and less reliable than the card readers here. Which is really saying, any idiot should be able to figure out the machines here. Clearly I was not dealing with your run-of-the-mill idiot. Being the nice guy that I am, however, I just pulled out my checkbook and started writing the check. Meanwhile, one of the woman's co-workers came over and started whispering loudly in her ear—"Did you just tell him we don't take cartes bleues? Why would you do that? You know we do! Now he has to go through all the trouble of writing a check!" I couldn't quite hear the woman's meek response. Then, since I was paying by check, she asked to see a photo ID. As is standard practice, I pulled out my passport and set it on the counter between us, with the giant eagle and block letters stating "UNITED STATES OF AMERICA" facing up. She flipped to the page with my picture. If you have a passport, take a look at that page. There is a message from the "Secratary of State of the United States of America" in three languages (English, French, and Spanish), an eagle holding the American flag, another set of big block letters with the country's name, a blank that identifies my nationality (spelling out the country's name), and above my picture are the giant block letters "USA." Anyhow, so the woman looks at my passport, confirms that I am who I say I am, than says: "Ah, vous êtes anglais?" Am I English?!? Not only did she fail to miss the overwhelming Americanness of my passport and my accent, but, correct me if I'm wrong, don't the English have exactly the same passports as the French now, thanks to the European Union? I'm still not sure why she wrote down my order on a giant sheet of paper, though I'm pretty sure it's sitting in a recycing bin by now. The woman at the counter then asked for someone to go fetch the stamps for me. With my wonderful view of the office, I noticed everyone hunch down just a little further over their desks, still looking away from the transaction happening at the counter. Finally, the woman disappeared around the corner for about 3 seconds, returning with my stamps (which you can see on the right, affixed to the appropriate letter). The kicker is that, even though all the postage stamps here are self-adhesive, the stamps that prove you've paid your taxes are not. As if I haven't kissed enough government backside in my quest for a titre de séjour! Your mother (in-law) and my coworker, Sue Roust, introduced me to J'habite à Paris! I have not met the Parisites, but did have an opportunity to visit Provence a few years ago. If you get the chance--or get homesick--try the south of France. Midwest hospitality and pace, South Dakota sunshine and winds all dished up with Mediterranean ease. Ok... I'm sorry. But, this is just the biggest cheeseball picture I think I've ever seen. Sorry Colin. I say you repost it and do one of those contests where people have to come up with a caption for the photo. Here's mine: "See, I told you I'm not pregnant! I've got pictures and a note from my mom to prove it." 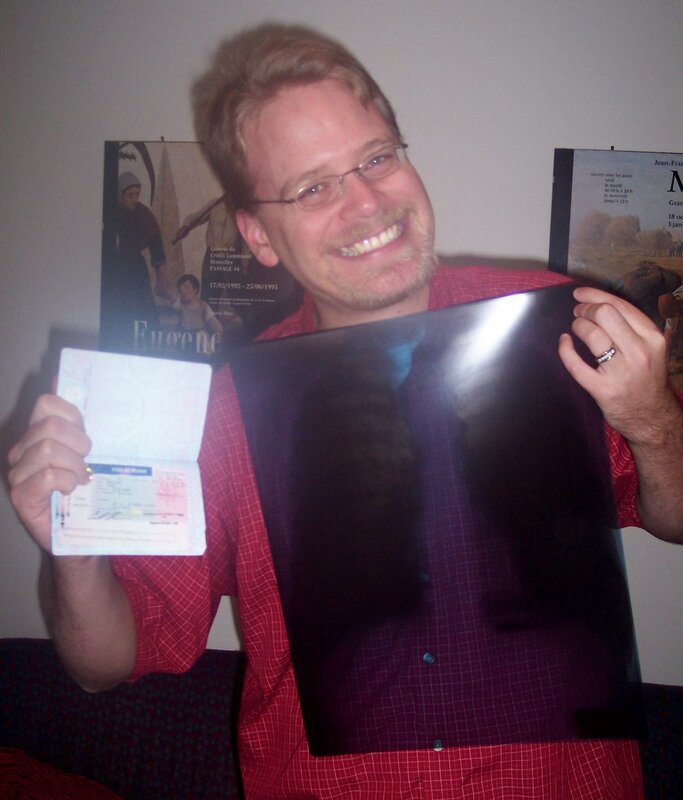 "Dude, check out the lungs on that guy!" Glad to hear you're healthy and that France will keep you. Colin smiles with relief as he takes a moment to appreciate the fact that his parents were able to follow the directions on their "some assembly required" baby kit approximately 27 years ago. The directions for this particular paint by number drawing looked difficult, but Colin still looked forward to the challenge.